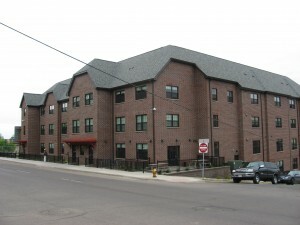 The New San Marco facility offers 70 units of affordable permanent housing in downtown Duluth, Minnesota, including 30 single room occupancy units for chemically dependent individuals and 40 efficiency units for people that have experienced chronic homelessness. The property was developed to bring housing and supportive services under one roof to help overcome the causes of persistent homelessness. Services are provided by the Center for Alcohol and Drug Treatment and the Human Development Center and include advocacy, mental health treatment, and alcohol dependency recovery for low income and/or homeless individuals. Center City Housing Corp. commissioned award winning documentary filmmaker Dan Woods, to tell the story of our once controversial, now highly successful New San Marco ASupportive Housing Project. The film, “No Losers” explores the transformations of individuals form lives of chronic homlessness to living well and doing well in a supportive housing setting. The film’s primary focus is on one half of a 70 unit building in Duluth, Minnesota that serves single adults who have long-term life experiences with chronic public inebriation. To view “No Losers“, click on the title.